What is the Sermon on the 'Mount'®? Lew Sterrett's Sermon on the 'Mount'® is truly a remarkable presentation you must see to believe. You will marvel as Sterrett uses horses in various stages of training to bring his heartfelt relationship illustrations. The purpose of the Sermon on the 'Mount'®: is to help men, women, and children understand how healthy relationships develop and how you can experience harmony and success in your life. 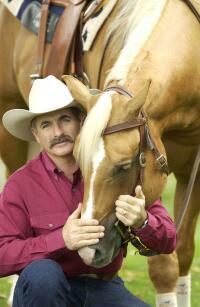 The Sermon on the 'Mount' uses Biblical principles to demonstrate loving, successful trainer-horse interaction. Both young and old will find this unique presentation entertaining, encouraging, and uplifting. A love offering will be taken for Sermon on the 'Mount'® at each presentation. Get Ready for A Fun Filled Family Evening! Each presentation is uniquely different so don't miss a night of the Sermon on the Mount® presentation.